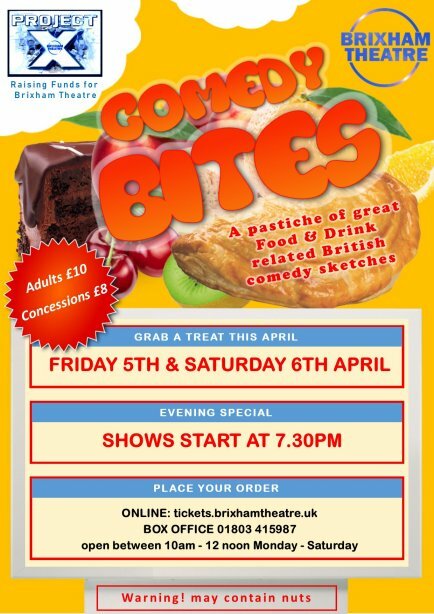 By booking tickets to see “Comedy Bites” on Friday or Saturday evening 5th and 6th April at Brixham Theatre (tickets.brixhamtheatre.uk) , you’ll not only have a big smile on your face from an enjoyable evening watching interpretations of famous British comedy sketches and songs, but you’ll be supporting raising funds for new equipment for your local theatre too. Sketches and songs from Victoria Wood, Monty Python, Fry and Laurie, Little Britain, Catherine Tate, The Two Ronnies are just a “taste “of what is in store…. In fact eighteen “food and drink “related sketches and song items are on the menu ! A group of local experienced performers and directors under the guise of Project X will serve up this delicious menu, having been involved in previous successful shows at the theatre including Fawlty Towers, Vicar of Dibley, Hi de Hi and The Best of British Comedy. It is hard to believe it is only from May 2018 that a wider group of volunteer enthusiasts formed a new Charitable Organisation (Brixham Theatre CIO) to take over the management of the theatre. Brixham Theatre CIO are expanding the programme of events and performance on offer at the theatre: are developing an increased use of the theatre by local community organisations and schools; finding innovative ways to support local festivals and business. Project X expands the theatre‘s education arm, whilst ploughing any monies raised into further theatre development.